How Dental Crowns will help you? The tooth which is broken or weakened can not perform its activity. A crown can be placed to make the tooth structure stronger. It is a restoration process of the remaining tooth structure. A crown is an artificial replacement that if placed over the remaining part of a prepared tooth, making it strong and giving it the shape of a natural tooth. A crown is sometimes also called a ‘cap’. Why would I require a crown? You may help hold a bridge or denture ﬁrmly in place. Crowns can improve the appearance of teeth. Crowns can be made of different materials and new materials are continually being advanced. Some of the most popular options are listed below. This is what most crowns are made from. 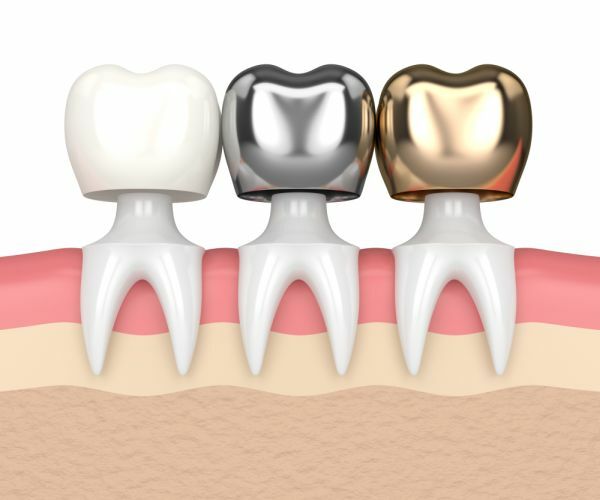 A precious or non-precious metal base is made and then porcelain is used in layers atop it. These are made completely out of porcelain and are not as strong as bonded crowns, but they can look very natural and are most often used for front teeth. This advanced technology offers a metal-free option, which can give the health of a bonded crown and the appearance of a porcelain crown. These crowns look similar to a natural tooth and are used on both front and back teeth. Gold is one of the best and oldestﬁfilling materials, Today it is worked with other metal alloys to increase its strength, which makes it a very hard wearing restoration. These crowns are silver or gold in color. A temporary crown will be fit to the tooth so that you can utilize the tooth while you wait for the crown to be made. This crown may be more noticeable and not highly comfortable but is only a temporary measure. You will need to have at least two visits. ﬁIn first visit your dentist will take the impression, shade taking and he may fit the temporary crown. In the second visit, the permanent crown will be cemented. There will usually be about 1 to 2 weeks duration required in between appointments. Does it pain while preparing the tooth for a crown? No, your dentist may give you a local anesthetic and the preparation should feel no different from a filling. If the tooth does not have a nerve, and a post crown is being fixed, then you may not require a local anesthetic. The crown will be made to match your other teeth as closely as possible. The color of the adjacent teeth will be registered, to make that the color looks natural and matches the surrounding teeth. Since the shape of the crown will be slightly different from the shape of your natural tooth, you will realise it initially. Within a few days, it should feel normal, and you will not notice it. How long your crown remains depends on how well you look after it. The crown itself cannot get the cavity, but the cavity can start where the edge of the crown joins the tooth. Therefore, to prevent cavity affecting the crown, it is important to keep this area just as clean as you would your own teeth. Brushing two minutes twice a day with a fluoride toothpaste and clean in between your teeth with interdental brushes or floss thread. Crowns can last for many years id it is taken care of. Your dentist will be able to tell you how long the crown may be expected to remain. Dr. Zeeta Antao Dental Director of Sabka dentist says “ A crown helps in a tooth function and also in a in its appearance”. Dr. Reena Waghela Dental Director of Sabka dentist says “patient who has broken tooth or suffered from deep cavity are rescued by Dental Crowns”. Dr. Jena Shah Dental Director of Sabka dentist says “6 people among 10 suffers from deep cavity and their natural tooth can be saved by dental crowns”.